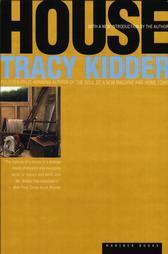 Tracy Kidder depicts the joys and challenges of home construction in House. I spoke this morning via Skype with dear friend Dan Middleton. In addition to being one of my favorite people on the planet, “Dano” is a former resident of Rokeby, an enormous and multi-room mansion that was the subject of a largely critical article this past week in The New York Times. Among other charges, the piece asserts that the home’s owning family, the Aldriches, of whom one relative is Dan’s stepfather, has insufficient funds to maintain the place. The three-page story goes on to paint a vivid picture of a largely ramshackle home that has seen far better days and that is more a bridge to an opulent past than to a vital present. Dan’s stepfather has written a letter to the Times asking for a series of corrections, if not an editorial note, to address what he sees as factual and copy editing inaccuracies. Although it is unclear whether Aldrich’s letter will be published, it is far more clear that homeownership is far from an undifferentiated set of joyful experiences. Dean of Western Massachusetts writers Tracy Kidder wrote House not about the maintenance of an old home like Rokeby, but about the design and creation of a new home. As almost always with Kidder’s books, the result is a fascinating stew of characters, technical information and the celebration of ordinary moments.